The Dwarven Excavation is an underground mining complex. It features tunnels and galleries dug for the sole purpose of extracting precious minerals, such as gold, silver, mithril and copper. But, often, the dwarves dig a tunnel they shouldn’t have dug, waking sleeping monsters, invading hostile territories and so on. 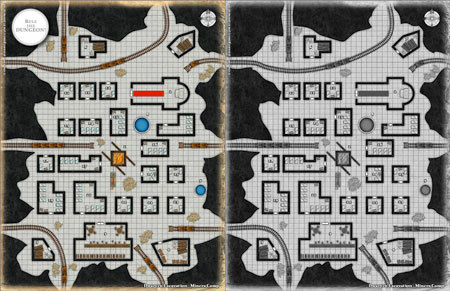 Dwarven Excavation presents four color maps you can arrange as you wish to form a larger map. You can event print more than one copy of the same map in order to obtain a bigger map. The mining camp is the first settlement the dwarves build. 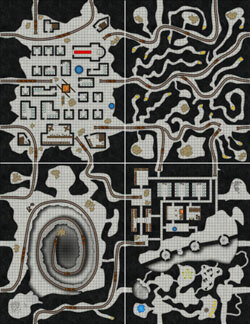 A large elevator connects this camp to the surface world (or to the dwarven city). All around the elevator spreads the mining camp made of mining huts lodging the miners. Warehouses keep the materials and tools of the trade and even an inn and a small chapel are found in this settlement. Many railroads for mining carts end their trail here. The Mines are a random excavation complex. Railroads go until it is possible, but many smaller galleries spread from the main railroaded tunnels. This large cavern hosts the largest excavation site of the entire mines complex. It is a large funnel going down for hundreds of feet. The dwarves didn’t feel discouraged and built a railroad winding down the shaft. Although it was a masterwork structure, it happens often that mining carts go out of the rails and fall in the shaft. Sometimes dwarves meet hostile underground dwellers that don’t allow further excavations. In such cases the dwarves set up a military outpost for the sole purpose of defending the territory. The military outpost is a self-sustaining structure with barracks, kitchen, forge and a well providing fresh water. An RPG Resource Review: The sheer variety, the wealth of ..